Three-team trade between Dodgers, Braves, Marlins finalized. A three-team, 13-player trade between the Dodgers, Atlanta Braves and Miami Marlins is done. As reported yesterday, the Dodgers would receive starting pitcher Mat Latos and outfielder Mike Morse from the Marlins, and pitchers Alex Wood, Luis Avilan, Jim Johnson, Bronson Arroyo and minor league utilityman Jose Peraza from the Braves. Atlanta would receive minor league utilityman Hector Olivera from the Dodgers — who would reportedly pay all of the $62.5 million contract he signed in spring — as well as injured left-hander Paco Rodriguez, Single-A pitcher Zack Bird and a 2016 compensation-round draft pick from the Miami Marlins, currently 35th overall. The Marlins would receive three minor league pitchers from the Dodgers: Jeff Brigham, Kevin Guzman and Victor Araujo, none of whom has advanced beyond high Single-A Rancho Cucamonga. 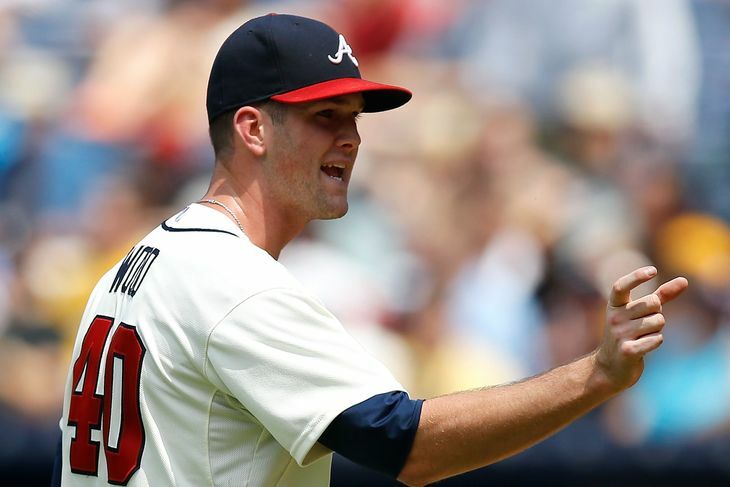 The Braves would reportedly pay some of Arroyo’s salary. The right-hander is on the 60-day disabled list recovering from Tommy John surgery in July 2014 and isn’t expected to pitch in a major league game until next year. Reports: Hector Olivera, Atlanta Braves involved in Mat Latos/Mike Morse trade. The Braves have asked the Dodgers about Hector Olivera. He could also be involved if this three-team deal is completed. Dodgers estimate Hector Olivera will miss 2-3 weeks with hamstring injury. A 2-3 week timetable all but guarantees that Olivera will not reach the majors prior to the All-Star break. Olivera was peaking at Triple-A Oklahoma City at the time of the injury, slashing .387/.387/.581. “He started getting his legs under him, timing at the plate, the quality of at-bats were really good,” Friedman said. “He’s played predominantly on the right side of the infield. It’s a different throwing stroke from second than from third. Jose Vizcaino was there for a week with him, pregame doing stuff on the chalkboard, then started ramping up to playing more games at third. That was the plan until he got hurt. Dodgers send Hector Olivera to Arizona to rehab a mild hamstring strain. CHICAGO >> Infielder Hector Olivera was placed on the 7-day disabled list at Triple-A Oklahoma City on Tuesday. Olivera is dealing with a mild (Grade 1) strain in his left hamstring, Dodgers manager Don Mattingly said. There is no formal timetable for Olivera to return to the field, “but I assume it’s going to be short,” Mattingly said. He’ll perform the rehab at the Dodgers’ Camelback Ranch facility in Glendale, Arizona. Olivera had missed the Oklahoma City Dodgers’ last two games. In seven games since his promotion Olivera has a .387/.387/.581 slash line. Hector Olivera finishes a double shy of the cycle at Triple-A Oklahoma City. Hector Olivera went 4 for 5 with two singles, a triple and a home run in the Oklahoma City Dodgers’ 6-3 win over the Memphis Redbirds on Friday. Olivera is hitting .388 overall in 11 games at Double-A and Triple-A, and .444 (12-for-27) since joining Oklahoma City. The home run was his first in Triple-A and his second since joining the Dodgers’ minor-league ranks. Olivera had a chance to complete the cycle in the sixth and eighth innings. He flew out to center in the sixth and was credited with a single in the eighth when his grounder hit Darnell Sweeney running from first to second base. Incidentally, the Oklahoman interviewed Olivera about his career in Cuba before coming to the United States. It’s worth a click.